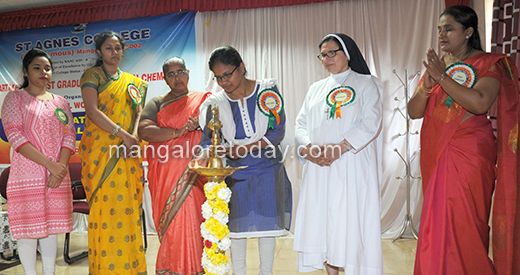 Mangaluru, Feb 14, 2018 : Post Graduate Department Chemistry of St. Agnes College had organized a two day National workshop on “computational and theoretical chemistry ” on 14 & 15 February, 2018 to highlight the basic and latest scientific advances within the broad field of computatonal chemistry in academia and industry. St Agnes College is a premier Catholic minority institution offering both undergraduate and Post Graduation studies. This autonomous College has been NAAC re-accredited with ‘A++’ grade and considered by the UGC as College of excellence. Having received autonomy, the College is poised for significant growth. The college has been recognized for the financial assistance under the Star College Scheme. The Department of Chemistry conducts a number of programmes to popularize Chemistry. Dr. Geetha Nazareth, the Head of the department of Post Graduate studies & convener of the workshop welcomed the gathering. The programme was inaugurated by lighting the lamp of knowledge by the dignitaries. The chief guest of the programme Dr Ganga Periyasamy Professor, Department of studies in Chemistry, Bangalore University gave the massage to the audience to take up Computational chemistry in their future. She emphasised significance of Computational and Theoretical Chemistry at present and future research. She enlightened the audience with her insights on the future research fields in Chemistry & the number of opportunities available for chemists. Dr Sr M Jeswina, president of the function, congratulated the Post graduate department for organizing the workshop, which would help to create green chemistry. The department had the honour of having the Resource person from Bangalore Dr Ganga Periyasamy, Professor from Bangalore University. 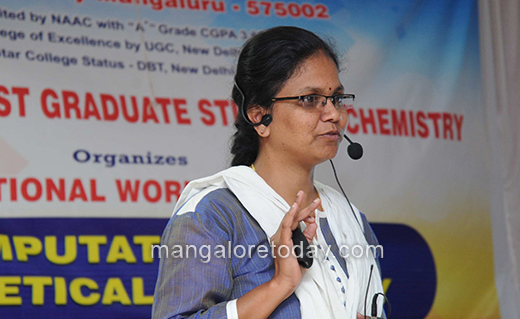 She is a National resource person on the use of Computational and Theoretical Chemistry. She gave Hands on training in the CTC & helped the participants to incorporate the Computational experiments which would create green environment. Ms Flora from II M.Sc Chemistry was the Master of Ceremony & Mrs Ananya student convener of the workshop delivered the vote of thanks.